This page discusses various ways to support The First Church of Penguinism and its related projects. First off, monetary support is not even close to the only type of support that you can provide. An organization like FCoP is nothing without people. The best thing you can do to support us is to learn more about us. We have a lot of information on this site. The front page has a full FAQ which answers a lot of questions on Penguinism and FCoP. Engagement of our fans is also very crucial to our success. Please follow us on Facebook and Twitter. We also have a Facebook group that you can join. Or come chat with us on Discord. Basically, interact with fellow Penguinists. Over time we’ll work to add even more ways to interact with us and fellow community members. Of course, monetary support is helpful. Especially right now, we need funds to pay for advertising costs, graphic design work, server fees, and other essentials that must be covered to continue bringing you Penguinist related content. If you want to support us, and also show off some funky merchandise, we’re working on a number of options. The main option available right now is REDBUBBLE. It’s a trial run, but there are t-shirts, pillows, stickers, and other items for sale, and more will be added as time goes on. Because it’s a trial run, there’s no separate account for FCoP merchandise and other products sold by FCoP’s founder, but all profits will go directly to FCoP operations. If you’d like to provide long term support, we do have a Patreon account. Monthly contributions will definitely help with basic expenses, and over time we’ll also use the funds to help promote conservation efforts and research. Backing at any of the contribution levels will give you early access to the draft of The Abridged Penguinomicon and brief (Penguinist) Answers to the Big Questions. Back at the $10 or the $49 tier and you’ll also be recognized with a role in our Discord chat. And if you back at the $49 tier, you’ll get a t-shirt after your first month’s pledge. 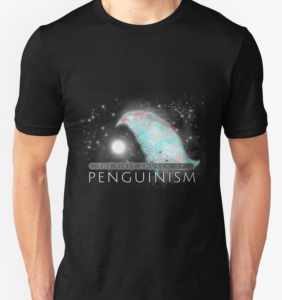 Below is a sample of the First Church of Penguinism t-shirt that you will receive for supporting us.